Ten-time Roland Garros champion Rafael Nadal and Juan Martin del Potro, playing some of the best tennis of his career in 2018, will square off in a blockbuster semi-final in south-west Paris on Friday. While Nadal has a 9-5 lead against Del Potro in their FedEx ATP Head2Head series, the pair has met only twice before on clay courts. In their two completed red dirt matches, Nadal beat Del Potro 7-5, 6-3, 6-2 at the Paris major in 2007 and 1-6, 6-4, 6-1, 7-6(0) in the 2011 Davis Cup final. Nadal also won their last clash in the 2017 US Open semi-finals 4-6, 6-0, 6-3, 6-2. Nadal, who celebrated his 32nd birthday on 3 June, is looking to secure a place in his 23rd Grand Slam championship final (16-7), while Del Potro, free from the wrist injuries that have hindered his progress for the past eight years, attempts to reach his second major final and add to his 2009 US Open crown (d. Federer). View FedEx ATP Head2Head for the Roland Garros semi-finals & vote for who you think will win! Beating Nadal on clay is one of the sport’s hardest propositions and at Roland Garros, where he has won an astonishing 84 matches, only two players — Robin Soderling in the 2009 fourth round and Novak Djokovic in the 2015 quarter-finals — have got the better of the Spanish superstar over five sets. Over the course of his 16-season pro career, Nadal is 108-2 in best-of-five-set matches on clay. So far in 2018, Nadal has put together a 28-2 match record (24-1 on clay courts). During the spring European clay-court swing the left-hander has picked up 11th titles at both the Rolex Monte-Carlo Masters (d. Nishikori) and the Barcelona Open Banc Sabadell (d. Tsitipsas), in addition to an eighth trophy at the Internazionali BNL d’Italia (d. A. Zverev). His lone defeat on red dirt came against Dominic Thiem in the Mutua Madrid Open quarter-finals. The 29-year-old Del Potro, who will be contesting his fifth Grand Slam championship semi-finals, has so far produced one of the best seasons of his career (28-6 match record). He has won two trophies at the Abierto Mexicano Telcel presentado por HSBC (d. Anderson) and his first ATP World Tour Masters 1000 trophy at the BNP Paribas Open (d. Federer) during a 15-match winning streak. The Argentine has also finished as runner-up at the ASB Classic (l. to Bautista Agut) in the second week of the year, which heralded his return to the Top 10 of the ATP Rankings. Already assured of a place in the world’s Top 4 on Monday with his semi-final run, Del Potro is hoping to follow in the footsteps of his Argentine compatriots — Guillermo Vilas (1975, 1977-78, 1982), Gaston Gaudio (2004), Guillermo Coria (2004) and Mariano Puerta (2005) — by reaching Sunday’s Roland Garros final. Nadal has spent marginally more time on the show courts at Roland Garros (13 hours, 10 minutes), while Del Potro has spent 12 hours and 59 minutes on court in his five victories. While Pierre-Hugues Herbert and Nicolas Mahut had reached the championship match at the three other Grand Slam tournaments, they had not enjoyed much success together at their home major – until this year. The Frenchmen, who had bowed out in the Round of 16 in 2015-16 and in their 2017 opener, moved within one win of the Roland Garros title with their 6-3, 6-4 semi-final victory over No. 8 seed Nikola Mektic and Alexander Peya on Thursday. Mektic and Peya had claimed the ATP World Tour Masters 1000 title last month at the Mutua Madrid Open, and were attempting to reach their fourth final of the clay-court swing. The sixth seeds now await the winner between No. 2 seeds Oliver Marach and Mate Pavic, the reigning Australian Open champions, and No. 12 seeds Feliciano Lopez and Marc Lopez, the 2016 Roland Garros champions. Marach/Pavic and Lopez/Lopez face off in semi-final action Friday afternoon. Herbert and Mahut will be looking to win their third Grand Slam title, following triumphs at the 2015 US Open and at Wimbledon in 2016. They were also runners-up at the 2015 Australian Open (l. to Bolelli/Fognini). Only two other French tandems have won the Roland Garros men’s doubles crown in the Open Era: Henri Leconte and Yannick Noah in 1984 and Julien Benneteau and Edouard Roger-Vasselin in 2014. Mahut, 36, came close to winning the Roland Garros title in 2013 alongside countryman Michael Llodra. The pair lost a heartbreaker against top seeds Bob Bryan and Mike Bryan, leading 4-2 in the decisive tie-break before the Bryans came back to win 6-4, 4-6, 7-6(4). French Open 2018: How do you stop 'King of Clay' Rafael Nadal? Marco Cecchinato will be hoping to continue his fairy-tale run on Friday in the Roland Garros semi-finals, with the pressure on Dominic Thiem’s shoulders as a two-time semi-finalist in Paris. 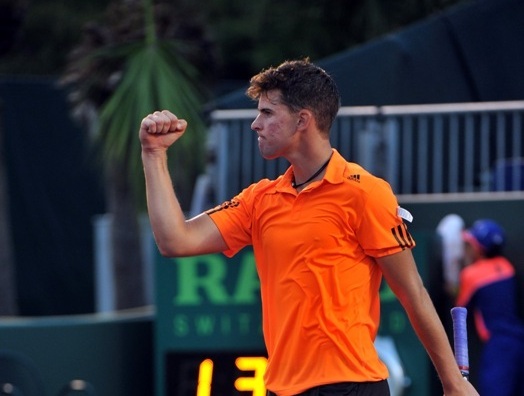 Seventh-seeded Austrian Thiem is currently on a nine-match unbeaten streak after winning his 10th ATP World Tour crown at the Banque Eric Sturdza Geneva Open. Cecchinato is playing the best tennis of his career, having beaten Top 10 seeds Pablo Carreno Busta and David Goffin before stunning 2016 champion Djokovic to reach the final four. The 25-year-old Italian has enjoyed a breakthrough European clay season, winning his first ATP World Tour title at the Gazprom Hungarian Open, as a lucky loser, before wins over clay-court specialists Fabio Fognini (BMW Open by FWU) and Pablo Cuevas (Internazionali BNL d’Italia). Cecchinato, the first Italian man to reach a Grand Slam championship semi-final since Corrado Barazzutti at Roland Garros in 1978, will also draw on his experience of beating his semi-final opponent at the latter stages of a tournament. Cecchinato emerged victorious, in straight sets, when the two met in the final of an ITF Futures event in Italy in 2013. Thiem, with a 25-5 tour-level record on red dirt this year, was highly impressive in his victories over No. 19 seed Kei Nishikori in the fourth round and second seed Alexander Zverev in the quarter-finals. On his fifth tilt at the clay-court major title, the Austrian will be focused on clinching a spot in his first Grand Slam championship final. Thiem is hoping to follow in the footsteps of fellow Austrian Thomas Muster, the former World No. 1, who lifted the 1995 Roland Garros trophy. Nicola Pietrangeli (1959-60) and Adriano Panatta (1976) are Italy’s only male major singles champions, both in Paris. World number one Simona Halep has another chance to finally land her first Grand Slam title after beating Garbine Muguruza in the French Open semi-finals. The Romanian, 26, won 6-1 6-4 against the Spanish third seed. She will now face Sloane Stephens in Saturday’s final after the US Open champion beat Madison Keys 6-4 6-4. The Romanian arrived in Paris as the top seed and the leading player on the WTA Tour this year, hoping this would be the moment she finally lands her first major. One thing Halep will not want to dwell on is the fact she has won only one of her past eight finals – including a defeat by Jelena Ostapenko in last year’s Roland Garros showpiece. Halep also lost to five-time Grand Slam champion Maria Sharapova in 2014, while she was also beaten in this year’s Australian Open final by Caroline Wozniacki. “I have more experience now,” she said. “I feel calm. I feel that I have to enjoy this victory because it’s a great match. Halep spent an hour longer on court than Muguruza in their respective quarter-finals on Wednesday, needing three sets to beat German 12th seed Angelique Kerber. By contrast, Muguruza breezed past Sharapova in a ruthless victory, but any thoughts those differing levels of energy burned would hinder Halep and motivate Muguruza were swiftly dismissed. Wimbledon champion Muguruza, considered the slight favourite by many, handed her serve over in the first game with a double fault on break point and Halep raced 5-0 ahead in the opening set. Halep lost focus to allow Muguruza to claw back one break, only to break again herself to seal the first set in 36 minutes. “She started playing very well immediately and I wasn’t able to reach the level that she was playing at. It was just lightning,” said Muguruza. The 24-year-old improved in the early stages of the second set, holding serve for the first time and backing it up with a break on her way to a 3-1 lead. That became 4-2 before Halep broke back for 4-4 and then held serve in a 14-minute game which went to a seventh deuce and saw Muguruza blow three break points. It was a gutsy hold which proved pivotal in the match and – if Halep goes on to win the final – in her career. Halep broke to love as Muguruza wilted in the next game, sealing her third final appearance at Roland Garros and ensuring she will stay as world number one after the tournament. “I think it was the most important game of the match,” Halep said on the penultimate game. In a re-run of last year’s US Open final, Stephens once again got the better of her fellow American Madison Keys in two sets. Tenth seed Stephens broke in the third game to gain an early grip on the first set, eventually serving it out and sealing it when Keys netted a forehand. The second set followed a similar pattern as Keys lost her first service game, although there was brief hope for the 13th seed when she broke for the first time when Stephens was serving for the match at 5-2. It was the first time two American women had reached the last four at Roland Garros since 2002, when Serena Williams beat sister Venus in the final. “It’s always hard playing someone from your country and your friend. I was pleased to get through that and play some good tennis,” Stephens, 25, said. Gordon Reid beat defending champion and world number one Alfie Hewett in an all-British quarter-final of the men’s wheelchair singles at the French Open. Scotland’s Reid came through 6-4 6-4 in 90 minutes against his doubles partner. It was the first time the pair had been drawn together in the opening round of a Grand Slam. Reid, who is looking for his third major singles title, will face Shingo Kunieda of Japan in the semi-finals at Roland Garros on Friday. The Glasgow-born 26-year-old was a finalist in the competition in 2016, when he lost to Gustavo Fernandez of Argentina. Juan Martin del Potro will return to the Top 4 of the ATP Rankings for the first time since February 2014 on Monday after advancing to the Roland Garros semi-finals for the second time (also 2009). The sixth-seeded Argentine fought back from 1-3 down in the third set on Thursday to beat third seed Marin Cilic of Croatia 7-6(5), 5-7, 6-3, 7-5, in a rain-interrupted two-day victory over three hours and 50 minutes. Del Potro will now look to improve upon his 5-9 FedEx ATP Head2Head record against World No. 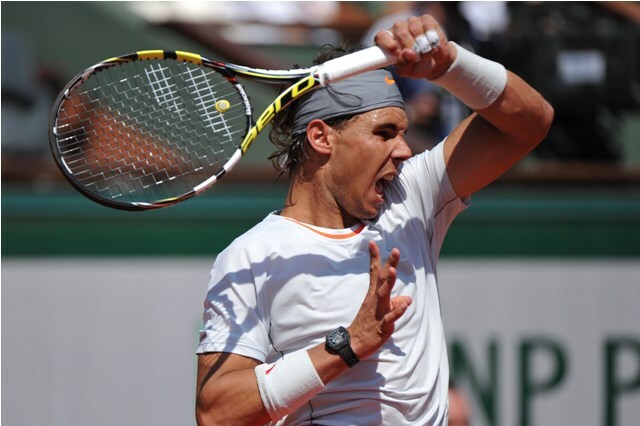 1 Rafael Nadal, the 10-time Roland Garros champion, who also battled hard to overcome Del Potro’s compatriot, No. 11 seed Diego Schwartzman, earlier on Thursday. In their only completed clay-court match, Nadal beat Del Potro 7-5, 6-3, 6-2 at the Paris major in 2007. Del Potro, who will rise from World No. 6 to at least No. 4, a position he last held on 10 February 2014, improved to 11-2 lifetime against Cilic, with his fifth straight clay-court match win against the Croatian. The pair had resumed their Paris clash at 6-6, 5/5 in the first set tie-break, after rain had suspended play on Wednesday night. Del Potro, who lost to Roger Federer in the 2009 Roland Garros semi-finals, struck 31 winners, including 19 aces against Cilic. In a match of small margins, it was Cilic’s 74 unforced errors that was the difference. The 29-year-old Del Potro has competed in three other Grand Slam championship semi-finals, highlighted by his lone trophy at the 2009 US Open (d. Federer). He has also lost at the semi-final stage at Wimbledon in 2013 (l. to Djokovic) and last year’s US Open (l. to Nadal). Cilic did well to avoid danger on Wednesday while serving at 5-5, 0/30, when rain first suspended their match. The Croatian recovered, saving three break points to hold for the sixth straight time. But he was not able to take advantage of two straight return points won on Del Potro’s serve in the tie-break, losing the final four points to fall a set behind. The first to serve on Thursday afternoon, the Argentine was immediately aggressive with his forehand to earn a set point, despite trailing 3/5 in the tie-break Wednesday. He then staved off Cilic’s aggression to his backhand corner, with the Croatian eventually netting a forehand to give Del Potro the opening set. Cilic came under pressure in the second set, including a 16-point fourth game. Through six games, Del Potro had won 12 of his 15 service points, while Cilic had earned 17 of 28, but the tables soon turned. Cilic became ultra aggressive, using his forehand to dictate play. Two break points for Cilic went begging at 3-3, but two games later Del Potro struck a double fault on break point, as he appeared to be distracted by a member of the crowd, who he immediately went to talk to. Clearly annoyed, Del Potro channelled his energy to break back immediately with Cilic committing three straight groundstroke errors. However, Cilic refocused to win 17 of the next 25 points, with Del Potro striking a forehand long — his 13th error to end the 66-minute set — and took a 2-0 lead in the third set. Miraculously, having saved one break point at 1-3, Del Potro went on a charge and clinched 19 of the next 22 points. Del Potro took control at 6-5 in the fourth set, sealing his first break point chance when Cilic lost his concentration and struck his third crosscourt backhand long. Del Potro did not need a second invitation, closing out the next game to love. Del Potro is now 28-7 on the year, which includes a 15-match winning streak and back-to-back titles at the Abierto Mexicano Telcel presentado por HSBC (d. Anderson) and his first ATP World Tour Masters 1000 crown at the BNP Paribas Open (d. Federer). Cilic, who had been bidding to become the first Croatian man to reach the Roland Garros semi-finals since Ivan Ljubicic in 2006, drops to a 22-9 mark on the season, which includes a runner-up finish at the Australian Open (l. to Federer). Defending champion Rafael Nadal reached his 11th French Open semi-final after ruthlessly turning around his rain-delayed quarter-final against Argentine 11th seed Diego Schwartzman. And he lost just four games on Thursday on his way to a 4-6 6-3 6-2 6-2 victory. The Spaniard will face either Marin Cilic or Juan Martin del Potro, whose unfinished quarter-final was also moved over to Thursday, in Friday’s semi-final. Whoever reaches the final from that side of the draw will face either Austrian seventh seed Dominic Thiem or unseeded Italian Marco Cecchinato in Sunday’s final.